I am so excited about this blog review I have for you today. I have several Eshakti pieces of clothing and they are all so comfortable, Once I am done wearing them my daughter takes them and wears them. This is the perfect dress(s) for a wedding, family photos, graduation, anything that you need a formal or even a dress for the office . just a couple of samples. An asymmetrical waist puts a fashionable slant on our cotton jersey knit dress sculpted with curve-flattering pleating before releasing to a full skirt. 4" above the ankle length. Cotton/spandex, jersey knit, light structured feel, light stretch, midweight. Model is wearing our size M/8, cut for her height of 5'9". Cinched at the waist with a removable knit belt to flaunt your shape, our mixed media shirtdress features a cotton knit bodice and a ruched tulle skirt. Lined skirt in light polytaffeta. Bodice: Cotton/spandex, jersey knit, light structured feel, light stretch, midweight. Skirt: Polyester, crinoline tulle, sheer, no stretch, light-weight. Available: Additional 6 neckline, 9 sleeve type and 10 length option(s). Make it suit your style! This is so dreamy. I want it for spring pictures as it reminds me of Spring and the ombre look gives me all the spring feels. 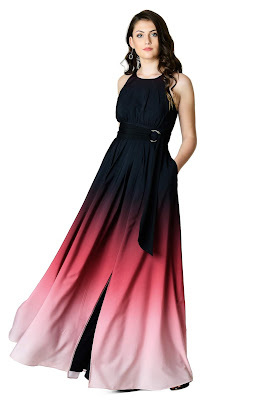 Festive ombre print shades our breezy crepe maxi dress detailed with a scoop neck bodice and ruched pleat full skirt with a high side vent for a flirty show of leg. 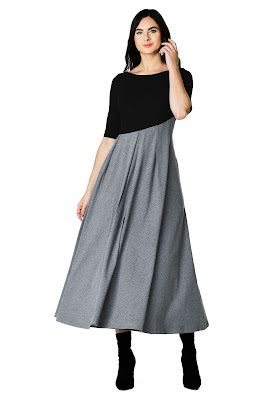 Wide banded waist, smocked elastic back waist. Attached wide sash-ties with D-ring closures. Lined in polyester moss crepe. Available: Additional 2 neckline, 8 sleeve type and 6 length option(s). Make it suit your style!